A well-rounded bigfoot researcher usually holds an interest in various aspects of anthropology and paleoanthropology. After all, it is these disciplines that will eventually tell us how sasquatches fit into the larger scheme of human evolution. Through these interests, I have found a number of noteworthy blogs and news sources that bring up interesting tidbits that directly tie into the search for relict hominoid populations, though even the authors of these blogs may not realize it. The certainty of this claim has now been called into question. In 2007 a metatarsal bone was unearthed from Callao Cave in the Philippines that was remarkably small, but a near-perfect match for a metatarsal from Homo floresiensis, popularly known as the Hobbit species, found on the nearby island of Flores. Could the metatarsals belong to a far-flung population of Homo floresiensis? If so, could the stone tools that predate Homo sapiens‘ arrival by half a million years also belong to Homo floresiensis? This all ties back into sasquatch in a roundabout way. Bigfoots are not the only unknown hairy hominoid reported in the world. There are a couple different types in Indonesia alone, one of which, called the Ebu Gogo, is reported right from the same island where Homo floresiensis fossils were found. This would strongly suggest that Ebu Gogo, if real, are in fact just relict forms of Homo floresiensis. If fossils of Homo floresiensis are verified from the Philippines, they could be found elsewhere, depending on how widely dispersed the species was. Could it be that the commonly reported “Brown Jacks” of Australia (short, hairy bipeds that are distinctly different than Yowie, according to the aboriginal people living there) are just more relict Homo floresiensis? This kind of thing keeps me up at night. Read the article so you can lose some sleep too. Great archaeological detective stories start with unexpected discoveries in unusual places. In May, an international team of scientists led by Thomas Ingicco revealed new archaeological findings from Kalinga, in the northernmost part of Luzon, Philippines. Until now, scientists have mostly assumed that the Philippines were first inhabited by modern humans, only after 100,000 years ago. But the artifacts unearthed by Ingicco and coworkers were much older, more than 700,000 years old. They didn’t find any hominin fossil skeletons, but the stone tools and the butchered remains of a rhinoceros show that somebody lived on this island long before modern people evolved in Africa. Luzon was never connected to the Asian mainland, even when sea level was at its lowest during the Ice Ages. To get there, ancient hominins had to float. Who were they, and how did they get there? Luzon isn’t the first deepwater island to produce such ancient evidence. In 2003, Indonesian and Australian archaeologists uncovered skeletal remains and ancient tools on the island of Flores. The bones were so strange, so primitive, that scientists named a new species, Homo floresiensis. The best-known fossil specimens from Flores come from Liang Bua cave, where they are between around 100,000 and 60,000 years old. Those bones include LB1, a skeleton which had a tiny brain, a small body, elongated feet and toes, and apelike wrist bones. Scientists called her “Flo”, and she was like nothing they had ever seen. The discovery gave rise to debates that are still raging, 15 years later. Who were the ancestors of the hobbits, and how did they reach Flores? We still don’t know for sure, and the mystery has only deepened since 2004. To read the rest of the article, click this link. Anthropology, Human Ancestors, paleoanthropology, Patterson/Gimlin Film Comments Off on Cause for Concern? A new article caught my eye the other day. It was published on the website, Ancient Origins, an online news source for those interested in popular archaeology with a dash of unusual thrown in. They claim to be the “only Pop Archaeology site combining scientific research with out-of-the-box perspectives.” This might be true. Thinking this was just another article about the 50th anniversary of the PG Film, I started reading and was very pleasantly surprised by the quality of writing and the perspective taken by the author. The author briefly acknowledged some of the erroneous scientific views from humanity’s past, went sufficiently deep into the work that has been done on the PG Film, and also explored the inevitable shift in paradigm that would occur if the film was authentic. It was at this point I looked at the author’s name: William Munns. Bill Munns is the number one expert on the Patterson/Gimlin Film. He wrote an excellent book about his research on the film entitled When Roger Met Patty. He is a methodical and scientific researcher who is meticulous with details and has an academic way with words. This article is a great primer in the work done on the film. It’s something you can email to your friends for them to consider. And with that in mind, friend, check it out! The anthropological sciences occasionally have to deal with something which has a profound but unexpected impact on our understanding of human origins. Two events are noteworthy, in part because both impacted powerfully upon our concept of human evolution, but also because they were diametric opposites. One was a truth first rejected, and the other was a false contrivance embraced as fact. As presented in Roger Levin’s fine text, “Bones of Contention”, the stories of the Piltdown Man and the Taung Child were meaningful because they demonstrated that ultimately the evidence will lead to the truth, but first, one must examine that evidence with an impartial and open mind. Sadly, they also illustrated that confirmation bias is a serious and formidable obstacle in the search for truth. Piltdown was a fraud, an orangutan jaw mated to a human skull, and it confirmed the bias of expecting that our human ancestor would be an ape-like body affixed to a human cranium, thus affirming that regardless of how primitive the body, the illustrious human mind remained robustly beyond any mere ape. Taung was a truthful hominid fossil, but its rightful place in human origins was rejected for many years because of its small brain. So, when we consider that some evidence with potential impact upon human origins is misunderstood, or suffers in the face of a confirmation bias, the idea has a solid foundation of prior examples demonstrating that exact issue. Today we have a new subject with the potential to make a profound and unexpected impact upon human origins and the human family tree. And like Piltdown and Taung, there is a legitimate concern that the evidence is not being given a proper and impartial evaluation, with confirmation bias ruling the roost and dissuading the scientific community from a proper consideration of that evidence. That new subject is actually 50 years old, but it is the age of the controversy that actually justifies a new way of thinking about it today. 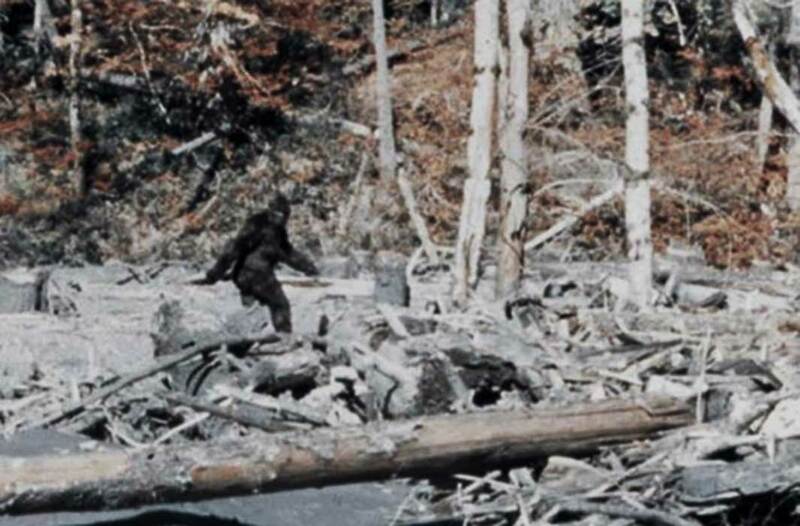 The subject in question is a 16mm motion picture film, taken in the woodlands of Northern California in 1967, famously referred to as the Patterson-Gimlin Film or PGF (in recognition of the two men who were present, one man filming and the other man witnessing the event), but it is informally known as “The Bigfoot Film” (in recognition of the subject figure seen in that film footage). For 50 years, people have been denouncing this film footage as a fake, yet there is virtually no rigorous and logically structured proof for that conclusion. All that can be found are insinuations, suggestions, unsubstantiated claims, and intellectual bullying to try and cajole people into accepting the claim of hoax as a fact. But in fact, the more rigorous the analysis, the more we see inconclusive determinations. David Daegling, in his text, “Bigfoot Exposed” analyzed the film and concluded, that at his time of writing, 36 years after the event, no proof of a hoax could be found. More recently, Authors Donald Prothero and Daniel Loxton, in “Abominable Science” could do no better, and their analysis of this film resulted in a meager comparison to an anecdotal bigfoot sighting by a man named William Roe. Their conclusion was that if Roe’s anecdotal account could somehow be proven false, then the PGF might reasonably also be deemed a fake. Given that Roe’s encounter cannot be proven false, this was a subtle but tacit admission that the PGF cannot be proven false either. There is much more to this article! Click here to read the rest. For those interested in unknown primates, the subject of paleoanthropology should be a subject of great interest. After all, sasquatches came from some lineage in the paleoanthropological family tree, so the more we learn about our ancient ancestory, the more we learn about sasquatches and the other undiscovered hominoids. It is with this focus that I eagerly devoured Tattersall’s 2015 book, The Strange Case of the Rickety Cossack: and Other Cautionary Tales from Human Evolution . The book’s author, Ian Tattersall, is the Curator Emeritus in the Division of Anthropology of the American Museum of Natural History in New York City. Though he started his schooling specializing in lemurs, his life’s journey has twisted and turned enough to find himself in a prominent and influential position well-earned through experience and publication. The book is a chronological tale of the history of paleoanthropology, its major players, and their specific discoveries from Aristotle and the other Greek anatomists through to the most active players in the field in 2015. Significantly, this includes the discovery of Homo floresiensis, though much more work has been done on those fossil hominins since the publication of the book. Credit must be given to Tattersall for his acknowledgment that these Floresian “Hobbits” were strangely archaic in morphology, and begging for a closer look, even back when he was writing the book. I found the book’s story to be a fascinating one, and hugely pertinent to sasquatch studies. Since sasquatches are real animals, they, like humans, have ancestors represented in the fossil record. Much can be learned about sasquatches simply by studying those bipedal hominins that came before them (and the same can be said about humans, which is why paleoanthropology is such an important and interesting science). Tattersall shows how the Single Species Hypothesis is no longer thought to be true, so he notes that numerous species of pre-human hominins lived concurrently on the planet, and indeed in the same areas at the same time. Curiously, he states unequivocally, more than once in the book that humans are the only hominin left alive on the planet. I guess I can’t blame him, but he is sure in for a surprise! For anyone interested in the sasquatch subject who loves the science behind mystery, I fully recommend this book. The overview of paleoanthropology is succinct and enlightening. The scientific language is digestible, not putting too many of the terms far above the head of the reader. Tattersall’s writing style is fully accessible to most scientifically-literate readers and laymen alike. To purchase this book, click this link, or on the picture of the book cover above. A new article published in Nature details the latest developments in the study of mysterious stone tools discovered on the island of Sulawesi in Indonesia. The makers of these tools remains unknown and is pondered in a previous blog article on this site. This discovery is pertinent to the study of bigfoot for several reasons. First of all, at least three species of unknown hominoids are reported throughout Indonesia. One fits the description of the orang pendek on Sumatra which can be speculated to be a type of bipedal orangutan. The other is more manlike, but smaller, and is referred to as the ebu gogo on the island of Flores. This form is probably a relict form of Homo floresiensis. The last of the three commonly reported forms fits the description of the North American sasquatch, and is in fact present in the folklore of Sulawesi where the tools were found. While it is unlikely that the larger, sasquatch-like form is responsible for these tools, the study of pre-modern humans and our relatives should always be encouraged. It is within this framework that the sasquatch will eventually be recognized by science. Though paleoanthropology is a newer science, it will certainly help provide a foundation for the subject of bigfoot and other unknown hominoids in the near future. For interested readers, the best book (by far) to detail the possible unknown hominoids found in the folklore of Southeast Asia is Images of the Wildman in Southeast Asia: An Anthropological Perspective by Gregory Forth. It is detailed, scientific, and open-minded while remaining skeptical. For any serious student of wildmen in that part of the world, I cannot recommend this book enough. The “hobbit” had neighbors. Back in 2004, researchers announced the discovery of this tiny, ancient human, which apparently hunted dwarf elephants with stone tools on the Indonesian island of Flores 18,000 years ago. Its discoverers called the 1-meter-tall creature Homo floresiensis, but skeptics wondered whether it was just a stunted modern human. In the years since, researchers have debunked many of the “sick hobbit” hypotheses. Yet scientists have continued to wonder where the species came from. Now, an international team originally led by the hobbit discoverer reports stone tools, dated to 118,000 to 194,000 years ago, from another Indonesian island, Sulawesi, likely made by another archaic human—or possibly by other hobbits. “It shows that on another island we have evidence of a second archaic early human,” says paleoanthropologist Russell Ciochon of the University of Iowa in Iowa City, who was not involved with the work. The discovery makes the original hobbit claim appear more plausible, he says, by suggesting that human ancestors may have island-hopped more often than had been thought. After international debate over the hobbit’s origins, co-discoverer Michael Morwood—then an archaeologist at the University of Wollongong (UOW) in Australia—set out to search other islands from which the tiny humans may have come. Java—more than 800 kilometers west of Flores but with a chain of islands in between—was already known to be the ancient home of the human ancestor H. erectus, a globe-trotting species that dates as far back as 1.7 million years ago. But Morwood instead set out for Sulawesi, 400 kilometers to the north, because powerful ocean currents sweep southward from this island toward Flores. Researchers had already found some simple stone tools on Sulawesi, but they couldn’t date the artifacts because they were found on the ground rather than buried with datable minerals.